ABOVE: A "Departure to America" sign marks the Steubenhöft pier, where emigrants, business travelers, and tourists once sailed from Cuxhaven to New York. From 1850 to 1939, an estimated 5 million Germans and Eastern Europeans sailed from Hamburg to the New World. (See more details in our Ballinstadt Emigration Museum article.) In the late 19th and early 20th Centuries, the Hamburg-Amerika Linie, or HAPAG, carried up to 200,000 emigrants across the Atlantic each year--together with business and leisure travelers who relied on ships for transportation between Germany and North America. In 1902, the city of Hamburg built a new "Overseas Harbor" in Cuxhaven to accommodate larger transatlantic ocean liners and growing passenger traffic. The Steubenhöft pier, a.k.a. the Hapag Halle, is still at the mouth of the Elbe River, 100 km or 60 miles downstream from the city of Hamburg. Although scheduled transatlantic service ended more than 50 years ago, Steubenhöft continues to serve cruise ships. But that's not all: The Cuxhaven Port Authority boasts that, "Since most European harbor complexes of this time have been destroyed, the Steubenhöft remains the only fully working passenger terminal of its kind." The Hapag Halle is on the waterfront in downtown Cuxhaven, within walking distance of the city's signature water tower (inset photo) and the railroad station. The main terminal building on the water is open daily, with a small Steubenhöft museum (free admission) and the excellent Seestern restaurant upstairs, where you can enjoy panoramic views of the water while you have lunch (I recommend the fried fish) or Kaffe und Kuchen in the afternoon. Guided tours are offered during much of the year by the Fordverein Hapag Halle Cuxhaven. For details, and to learn more about the terminal and its history, see the Web links below and the captioned photos on page 2 of this article. The Fordverein Hapag Halle Cuxhaven has an English version of its Web site with information about the pier's history, exhibitions, and guided tours. 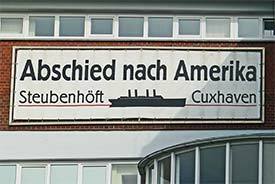 For tourist information about Cuxhaven, visit tourismus.cuxhaven.de. 2nd inset photo copyright © Martina Berg.